“I am happy” is a fine enough sentence for a six-year-old, but as we get older, that simplicity doesn’t always cut it. Are you “watching-your-son-take-his-first-steps” happy, “just-won-the-presidential-election” happy, or maybe “getting-released-from-jail-today” happy? Finding the perfect word to pinpoint an emotion can be difficult, and sometimes we may need a little help. Enter: the Wheel of Feelings! (OK, technically I gave it that name– but I’m hoping it will catch on!) This circular diagram from English teacher Kaitlin Robbs is perfect for finding the right word for the right feeling. 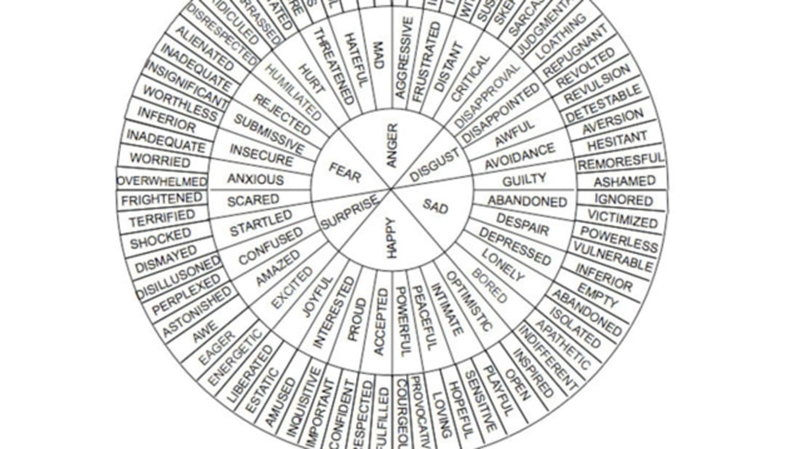 The most basic emotions (e.g., happy, sad, fear) make up the center of the wheel, and as you move outward the synonyms get more complex (e.g., loving, remorseful, alienated) until you’ve found the word you were really looking for all along. This tool is a must-have for writers of all ages, or people just looking to improve their vocabulary.